Farm Aid: Saving the Family Farm The Kitchen Sisters visit the 21st annual Farm Aid benefit concert in Camden, N.J., for some turkey-stuffin', potato-mashin' music and some deep stories of an endangered tradition — the American family farm. 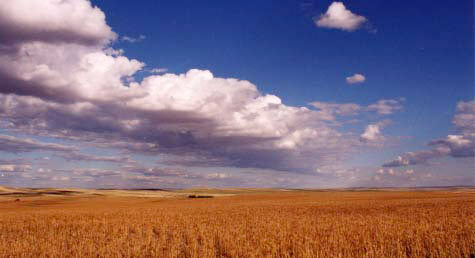 Wheat fields extend through the Waller family farm and cattle ranch in Circle, Mont. 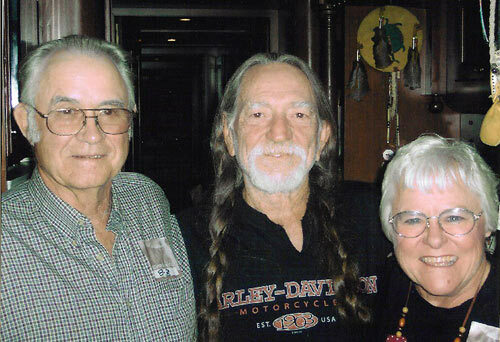 Farmer-ranchers Gordon and Helen Waller meet with Willie Nelson (center), co-creator of the Farm Aid concerts. From their kitchen tables to yours, farmers from around the country offer their favorite recipes. 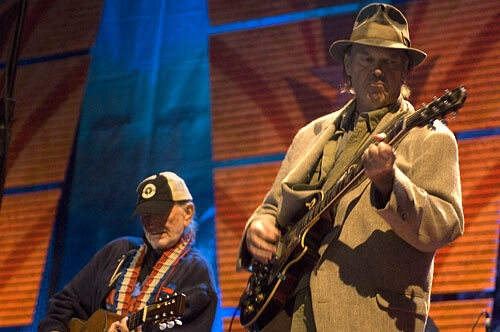 Farm Aid co-founders Willie Nelson (left) and Neil Young perform at the series' 21st annual concert in Camden, N.J.
Ann Cooper, Berkeley Unified School District nutrition director, talks about being a lunch lady without a stove. David Amram, composer, artist, farmer and longtime supporter of Farm Aid describes "the reason why we're here." Hear messages from the 'Hidden Kitchens' hotline about programs to help farmers around the country. Far Out Food Ventures, North Carolina: Educating kids about healthy food. Home Fields, Millersville, Pa.: A unique cooperative farm program. 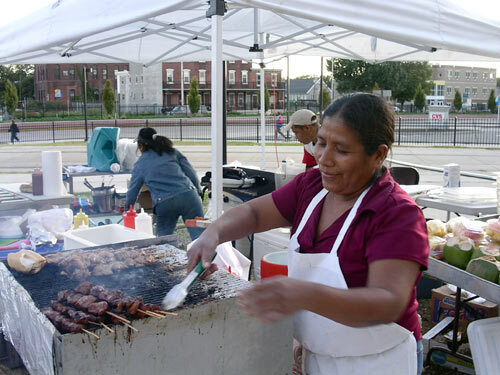 The joys of the Troy Waterfront Farmers Market, Troy, N.Y. The Food Project: An inner-city youth farming program in Boston. 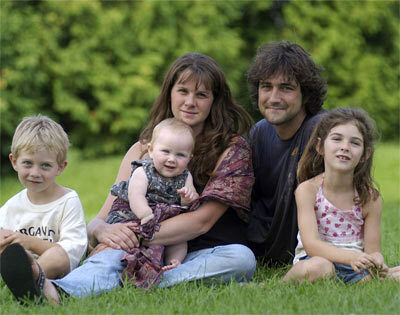 Travis and Amy Forgues (seen with their children Gabriel, Emma and Molly) are organic dairy farmers and spokespersons for sustainable agriculture in northern Vermont. 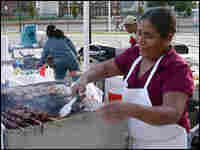 A vendor works a grill at the Camden's Farmers Market, Camden, N.J. Bill Clark, executive director of Philabundance, the region's largest food bank, estimates that there are close to a million people at risk of hunger in the region. Farm Aid is as much a ritual gathering of America's farming community as it is a fundraiser and a concert. At the annual event, corn and pig farmers trade tips and plot lobbying strategies, and college kids listen as Dave Matthews plays a killer set. It's a story of hard times and new possibilities, of farmers markets, of young people, whose parents were forced off the land, returning to farm again, and the beginning of new food chains. 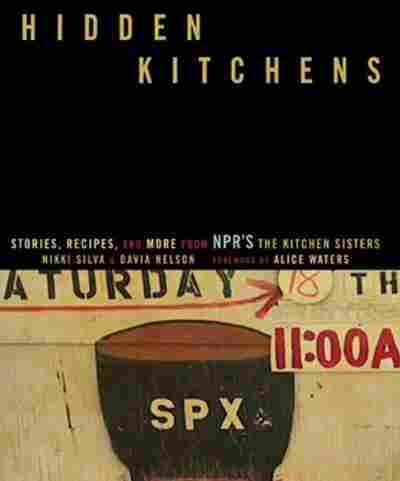 The Kitchen Sisters traveled to Camden, N.J., this fall to document Farm Aid for Hidden Kitchens. Strange as it seems, in our two years of foraging for Hidden Kitchens, we had never contemplated this unexpected community ritual — this mix of artists and farm people from all states and political persuasions coming together to help save an endangered American tradition: the family farm. Farm Aid is a call to arms supported by a rockin' soundtrack. Twenty-one years ago, Willie Nelson joined with his friends Neil Young and John Mellencamp to create a benefit concert to raise money for family farmers and to draw attention to the staggering farm crisis going on in America. Farm foreclosures, small farmers forced to sell out to developers and factory farms, a farm bill that favored corporate agriculture and offered little help to struggling family farmers. 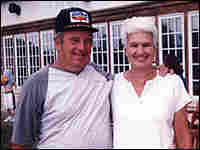 There were a lot of suicides in the farming community that were going largely unreported, a lot of farmers that had nowhere to turn. One of the first things Farm Aid did with the $10 million it raised at that first concert was join with farm organizations across America to set up hotlines farmers could call for counseling and emergency aid. Those hotlines are still ringing. "Three days after Katrina, Farm Aid was on the ground with us saying, 'Here's a check. Can you get it to farmers without a lot of red tape?' Weeks later, there was Farm Aid again calling to offer training and support for farmers who had been impacted by the storm," says Ralph Paige, director of the Federation of Southern Cooperatives, an organization that formed out of the civil rights movement to help black farmers stay on the land in the rural South. He has participated in Farm Aid since its inception. "Without Farm Aid, I honestly believe there would be many less farmers in this country," Paige says. Over the years, performers have included Emmylou Harris, Bob Dylan, Tom Petty, Daniel Lanois, Los Lonely Boys, Steel Pulse, Steve Earle and Jerry Lee Lewis, along with founders Willie Nelson, Neil Young, and John Mellencamp, and their newest partner Dave Matthews. You name it, they've tithed themselves to Farm Aid. Farm Aid is so much more than a benefit concert. Executive Director Carolyn Mugar describes it as "the big tent" where people from all across the food chain come together to share, brainstorm and debate. This year's event featured panels of farmers, activists and thinkers brainstorming the latest issues impacting agriculture and communities — school lunch, safe water, farmers markets, alternate farm-raised fuels, chemical-free fields, sustainable local food systems that cut down our dependence on fossil fuels and foreign oil and a new farm bill that encourages small family-run farms and organic production. This year, Farm Aid was in Camden, N.J. — recently designated one of the most violent and poorest cities of its size in the United States. Bill Clark, executive director of Philabundance, the region's largest food bank, estimates that there are close to a million people at risk of hunger in their area of the Delaware Valley. "Fresh vegetables are one of the hardest things to get when you're poor," Clark says. One of Philabundance's primary suppliers is New Jersey Farmers Against Hunger, a group that organizes gleaning operations throughout the Garden State. 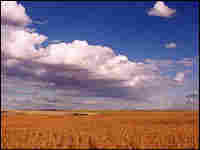 "Gleaning is an activity that goes back to biblical times. When a farmer was done with his harvest, he would open his fields to the poor of the community. Today, volunteers — Boy Scouts, students, church groups — work as gleaners gathering food for the needy that would otherwise rot in the fields." Our thanks to Musicians: Willie Nelson, Neil Young, Dave Matthews, John Mellencamp, Mickey Raphael, Bee Spears, Los Lonely Boys and David Amram. Farmers & Activists: Helen Waller, Northern Plains Resource Council; George Naylor, National Family Farm Coalition; Corky Jones, National American Agricultural Movement; Karen Washington; Larry Mitchell, the American Corn Growers Association; Ralph Page, Southern Federation of Farmers; Travis Forgues, Forgues Family Farm; Kate Duesterberg and Will Allen, Cedar Circle Farm; Bob Scowcroft, Organic Farming Research Foundation; Ann Cooper, "Lunch Lady," Berkeley Unified School District; Tom Strumolo, the New York Greenmarket; Bill Clark and Martha Buccino, Philabundance; Linda Boclair and Maceo, the Camden Community Farmers Market. The Farm Aid Staff: Mark Smith, Carolyn Mugar, Glenda Yoder, Ted Quaday, Wendy Matusovich, Jennifer Fahy, Jennifer Cram, Laura Freden, Katie Matus, Nahreen Ghazarian. Thanks also to: Cindy Carpien, Mary Kay Place, Brandi Dobbins, Elaine Schock and Shock Ink, Glenn Walters, Henry Poirot, Ellen McDonnell, and David Anderson. Produced by The Kitchen Sisters (Davia Nelson & Nikki Silva) in collaboration with Laura Folger, Nathan Dalton, Kate Volkman & Jaime York. Mixed by Jeremiah Moore and Jim McKee.